My former work colleagues invited me to dinner the other night. I was so excited I turned up half an hour early. Sahara is up a creaky flight of stairs off Swanston Street, a bejeweled, dark wood oasis with a rooftop bar to top it off. Inexplicably, on a cold August night, the over-sized restaurant door was propped open and no radiant heater could counter the cold current of air permeating the space. The server told me that they intended to leave the door open all evening, and they did. It beggars belief that so many Melbourne eateries defiantly ignore the winter months, leaving so many of their diners eating indoors in their overcoats. Sahara’s rich Moroccan ambience turned out to be a good indicator of the richness of the food, but it ocurred to me that the seating was not designed to encourage a relaxed dining pace: most of the seats were either high bar stools or hard wooden benches with no backs and cushions that slid away from you. Between that and the Arctic breeze blowing through the room, I was often more aware of my physical discomfort than the quality or otherwise of the food. Despite the chill in the air, the food was enjoyable: bread, dips and bruschetta to start, with most people choosing a tagine of sorts for main course. The chicken salad sounded like a tame choice by one of my fellow diners, but the dish was plentiful, delicious and full of flavour. The lamb and beef tagines were rich in colour and aroma. My Moroccan fish masala tagine was reminiscent of a good fish korma, all creaminess and almonds. Just divine. 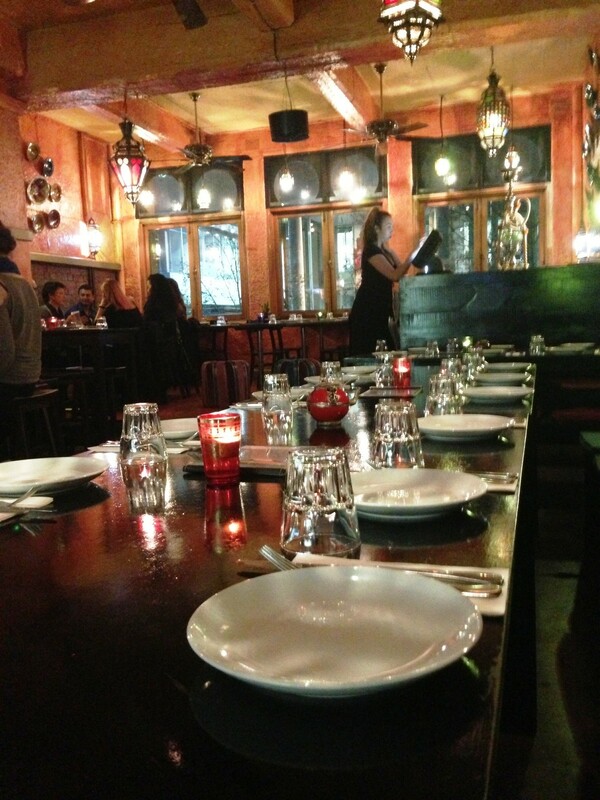 Sahara are happy to cater for gluten-free types, and the servers are by and large a friendly bunch – up to a point. At just past 9pm on a Wednesday we were the last people in the place, and (perhaps because our BYO wine was not making any money for them) we were given ten minutes to finish and go. I wouldn’t mind heading back to Sahara another time, but it wouldn’t my first choice. The food is decent but the physical environment just takes the edge off it for me. Maybe I’m just getting old. Don’t think I’ll be visiting – thanks for the heads up!